Palm Beach: New construction with contemporary interiors, perfectly scaled rooms with exceptional Italian design and craftsmanship throughout. Highlights are sweeping water views of Ocean & Lake with 177' of Oceanfrontage and 1.86 acres of land. Grand living room w/ 22' high ceiling, 14' ceilings on 1st floor & 10' ceilings on 2nd floor. 7 bedrooms, 9 full baths & 5 half baths, 44' pool, 200' dock, North/South lake side tennis court & commercial pizza kitchen only offered in this One Of A Kind Estate. 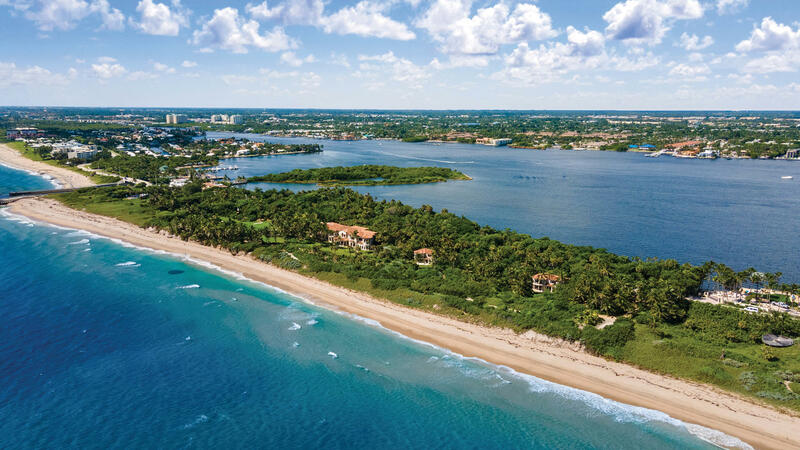 Palm Beach: Located on prestigious South Ocean Blvd, the property sits on 2 1/4 +/- acres with 274 +/- feet on the Atlantic Ocean and Lake Worth.Eight Bedrooms, 11 full baths and 8 half baths are provided in the main house and guset house. Gables Estates: Extraordinary Neoclassical waterfront estate in the exclusive guard-gated Gables Estates. Sitting on 2.38 acres of abundant tropical landscaping including over 600 different species of palms, trees, plants and flora all perfectly positioned to thrive. The estate radiates elegance with dramatic hallways to highlight the groin vaulted arches, arched doorways, and impact windows to allow for the natural light to emphasize the grandeur of the home. With beautiful combinations of marble and rich wood floors, bright open spaces, high ceilings, and fabulous views of the gardens and waterway throughout the home. READ FULL DESCRIPTION IN TAB ABOVE. Seminole Landing: Secluded on 1.4 gated acres in Seminole Landing is an estate of understated elegance and Caribbean inspiration. The 25,878-square-foot residence takes full advantage of its oceanfront location, blurring the lines between indoors and out and allowing for the most pleasurable resort like lifestyle. The style of British West Indies--with its breezy outdoor spaces and light-filled, view-focused interiors--offered inspiration and was adapted for relaxed, refined modern living. Gables Estates: Lush, tropical landscaping is the essence of El Palmar, a truly unique residence located in the heart of Coral Gables on one of its largest waterfront properties. A majestic, storybook setting crafted by renowned architect Cesar Molina and landscape artist Raymond Jungles. El Palmar is showcased as art, with native species, a stunning koi pond and coral rock pathways harvested on site. An open family room, a quiet library, a 2,000-bottle wine cellar, an expansive kitchen, pub-style bar, living room with fireplace, a private service wing and an elevator. Impressive summer kitchen, large pool and boathouse offer the perfect environment to unwind. A private and custom 110’x36’ boat inlet keeps water-crafts & allows for uninterrupted water views - a total of 335’+/- of water frontage. La Gorce Golf: The Trophy Mega-Mansion in Miami Beach! A rare opportunity to purchase 2 prime adjacent properties on prestigious North Bay Road (6360 N Bay Rd + 6342 N Bay Rd). You will enjoy the most extravagant waterfront lifestyle from your brand-new home that will be sitting on a combined lot of 52,015-SF with 212-FT of wide waterfrontage on Biscayne Bay. 6360 N Bay Rd is asking $29.5M, home built 2018, 13,381-SF, 13 beds, 14 baths, 3 powder rooms, 3,000-sf roof decks, 2,700-sf covered terraces, 4/4 guesthouse, 3-car garage, 27,607-sf lot with 100-FT of waterfront. 6342 N Bay Rd is asking $12.5M, a teardown with 24,407-sf lot & 100-FT of waterfront. This is the only brand-new mansion for sale in Miami Beach with this lot size & waterfrontage. These 2 properties can be bought separately or together. Palm Beach Point: A VERY SPECIAL OPPORTUNITY TO OWN AN OLYMPIC EQUESTRIAN FACILITY, IN A VERY EXCLUSIVE SECURE COMMUNITY IN WELLINGTON FLORIDA. THE WINTER HORSE SHOW CAPITAL OF THE WORLD. THIS PROPERTY WAS DESIGNED FOR THE EQUINE ATHLETE. EXERCISE TRACK CONSISTING OF ROLLING HILLS THROUGH A PARK LIKE SETTING WITH TOP NOTCH FOOTING TO WORK THE HORSES. TWO SOPHISTICATED BARNS 26 STALLS TOTAL. 29 PADDOCKS, 2 ROUND PENS, COVERED RING WITH MIRRORS, OUTDOOR RING WITH MIRRORS, 3 GRASS RINGS. 4 GROOMS QUARTERS, 2 HOMES WITH POOLS 1 GUEST HOUSE. 3 GENERATOR SYSTEMS FOR THE PROPERTY. COMPLETE SECURITY SYSTEM. SAVANT SYSTEMS INCLUDING WEATHER HAWK. FOR A LITTLE RELAXATION AFTER THE HORSES BRUSH UP ON YOUR GOLF WITH THE 3 GREENS. Star Island: PRESTIGIOUS PALM BEACH ELEGANCE MEETS THE HIP SOUTH BEACH LIFESTYLE IN THIS EXTRAORDINARILY RENOVATED WATERFRONT VILLA WITH A MODERN TOUCH! The Most Prime Location on Star Island, this Legendary Venetian Villa built by Carl Fisher in 1924 on a Pie-shaped Lot just under 1.5 Acres & w Breathtaking Open Bay Views. 255 FT of Waterfront ideal for yachts, Originally Developed as the Yacht Club on the 1st man-made Miami Beach Island. Gut Renovated in 2017- restoring Architectural Details in Formal Entertaining Areas while blending Fresh & Relaxed style in Casual Spaces & Ultra Modern Kitchen. Lushly Landscaped Garden & Pool designed for Intimate & Glamorous Formal Entertaining. 10 Beds + 10.5 Baths Walled & Gated w 20,000 SF of Interior Living Space Perfect for Families to Enjoy Life at the TOP! Cocoplum: UNIQUE ESTATE HOME located on a peninsula in the exclusive Gated Community of TAHITI BEACH ISLAND. The one offers 21,235 square feet of living space on a 62,051 square foot lot with 10 bedrooms and 10 ad half bathrooms with Private sandy Beach, expansive Ocean View, soaring ceilings, wine cellar, media room with theater seating, gym, 2 kitchens, elevator, sauna, spa and beautiful outdoor area with lounge seating, BBQ area and heated pool. The property offers iPad control system for lighting, music, air conditioning, TVs throughout the estate. The house was built in 2009 and has Tuscan architecture exterior which was designed by famous architect Ramon Pacheco. The house was Completely Renovated in 2016. Gables Estates: The 205 ft waterfront takes stage at the exceptionally detailed 7 bedrooms, / 8.5 baths home spread over 4 magnificent acres. Complemented by elegant interior, a great foyer leads to spacious living areas, gourmet kitchen with sleek stainless-steel appliances, breakfast area, a formal dining room and a luxurious master suite upstairs with bathtub and marble floors. The property comes outfitted with amenities like a pool, spa, koi pond, tennis court, summer kitchen, barbeque area, large wine cellar, gym, game room, movie theater room and its own dock, providing boaters easy access to the bay and beyond. Echo Brickell: Personally designed by Carlos Ott, the Penthouse at Echo Brickell is the only residence occupying the upper floors of this iconic building. Featuring a two-story layout with breathtaking views of Biscayne Bay, the Atlantic Ocean, and Downtown Miami. The residence offers direct elevator access 524 sqft foyer, an indoor 26-foot lap pool, private gym, sky garden, and 1,209 square feet of 8-foot deep terraces. Interiors feature 23-foot ceilings, with floor-to-ceiling windows, marble flooring, 7-foot Italian entry doors, and Poliform kitchen cabinets. The building has full concierge services. Echo Brickell is an innovative, contemporary tower at the epicenter of Miami’s fastest growing metropolitan neighborhood.